Derek is a seasoned pro and has worked in some of the most highly regarded kitchens around the world! During his travels, Derek has mastered working with different local ingredients and he really knows how to make a dish feel and taste authentic. 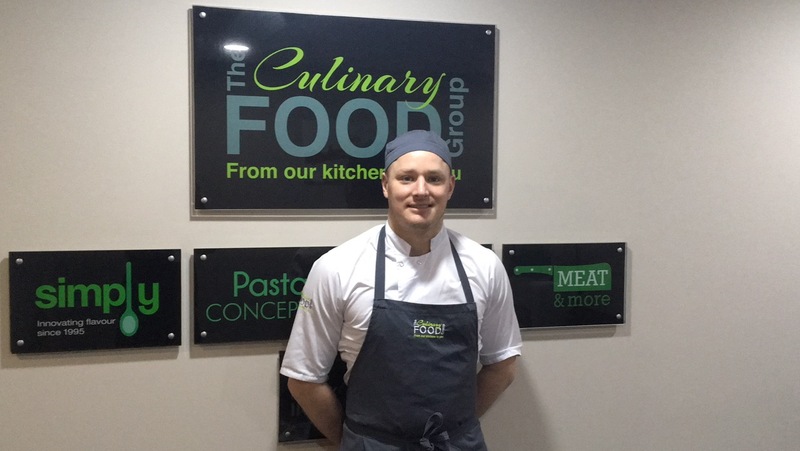 He tells us that the most important thing about working in the food industry, no matter if it’s a small restaurant or a large-scale food manufacturer, is making sure you’re working with fresh, high quality food ingredients. We sat down for a chat to learn how Derek found his way into the industry and what he has been up to lately. I’ve been a chef for 10 years now, after college I travelled and worked in kitchens, catering companies and cookery schools in the US, Canada, Australia, New Zealand and Thailand – that gave me a lot of different experiences and I gained an understanding of how to get the best out of the ingredients I worked with. When I came home in 2014, I really wanted to find a role that would nurture creativity and I was keen to focus on current food trends and innovations in the industry. Keeping up with the latest trends has always been a passion of mine. I’ve been with The Culinary Food Group for two and a half years now and I’m happy to say that I am one of those people who genuinely loves coming into work every day! I’m constantly learning and improving recipes and the food industry is ever-evolving so it’s a really exciting business to be in. What’s your normal week look like? I predominantly work in The Sauce Room and Meat & More where we design and create sauce solutions and new food concepts in response to our customer’s requirements. We’re lucky to have access to our superb stocks that are a joy to work with, and this gives us the ability to provide bespoke, high quality products to our customers. In my capacity as Senior Innovations & Development Chef, I’m responsible for several client accounts and it is imperative that I keep in regular contact with all my customers to make sure that both the quality of the service and the level of customer satisfaction is strong. But also I want to make sure they know they are getting a hands-on committed service from me. Also, I play a large part in the training and mentoring of new kitchen staff. Customer presentations are an important part of my role and are a great way to show new and existing customers exactly what we do – in a way that is reflective of both modern cookery techniques and current trends. Being The Culinary Food Group, we are very much culinarily led so each of our chefs has many years of industry and restaurant experience, which we feel always shows through in our presentations. We try to stay abreast of who and what is paving the way in the culinary world and we use that knowledge to set us apart. In your opinion, what are the current challenges for the industry? Over the last few years we’ve had great success in the UK market place and we’re a little uncertain how Brexit will affect things. We’re keeping a close eye on developments and our best way forward is to keep up-so-speed with trends in the marketplace and make sure we stay on top of our game, building our reputation as top quality food suppliers for customers in the UK. From a food perspective, there’s a strong focus at the minute on the levels of sugar and salt being used in food products. Luckily managing the use of these ingredients has been an important aspect of our business and as a rule we strictly adhere to all salt guidelines and we reduce sugar wherever possible. Creating tasty meals but keeping them healthy is very important. We’re very conscious to select the best food ingredients from quality suppliers. So, you love to keep up with the latest trends – please, tell us more! Healthy eating has been a long-standing trend with no signs of abetting, tying into that would be the rise of the Flexitarian diet, whereby people are more often than not eating meat free meals upwards of 3 times a week. Seaweed has long been lauded for its health benefits and although it has been traditionally eaten in Ireland for centuries, recently there’s been a newfound love affair for it. We are lucky enough as a nation to grow some of the very best food ingredients in the world and we export them globally. Many new contemporary restaurants are tying seaweed into numerous dishes on their menu, particularly in the New American style, which is an exciting trend that I’m a big fan of. Broths, or bone broths (which is essentially the type of stocks we mainly produce in Simply) is another product currently booming on the market, which can again be tied into the healthy eating bracket. The use of light broths with minimal added ingredients is part of the move towards clean eating. Indian street food is trending massively in the culinary world at the moment, and with such amazing flavours it’s easy to see why. We’ve created some knock out sauces that’ve been big hit with fans of authentic Indian food. Having the Culinary Innovation Centre available is a real asset when we are busy creating our latest culinary masterpieces!! Finally, a very large global trend is the desire to search out craft or small batch. This doesn’t just apply to food, it’s also very prevalent in the beverage industry. But small, craft butchers, cheesemongers, breweries & delicatessens are definitely on the rise and for very good reason in my opinion. Small production allows them to focus on the quality of every product. Something I can proudly say that we replicate in a large scale across the whole of the Culinary Food Group. If any of the readers out there are in the market and would like to find out more about what’s happening in the industry they should get in touch with the team and either myself or one of the other development chefs can talk through it with them. I’ve no doubt we can come up with something exciting and maybe start our own trend!